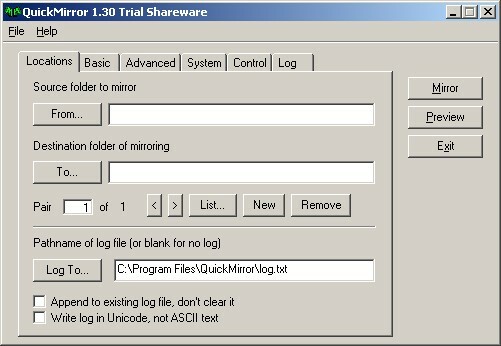 QuickMirror is a Windows file management utility that quickly transforms destination folders into mirror images of source folders. Variations of mirroring are allowed through basic and advanced options. All mirroring actions can be saved into a log for future review. A preview command enables testing mirroring options on the source and destination folders, and when used with logging, provides a way to see the results of mirroring beforehand. Qweas is providing links to QuickMirror 1.30 as a courtesy, and makes no representations regarding QuickMirror or any other applications or any information related thereto. Any questions, complaints or claims regarding this application QuickMirror 1.30 must be directed to the appropriate software vendor. You may click the publisher link of QuickMirror on the top of this page to get more details about the vendor.